The book is complete but as of early December, it was not printed yet in hard copy, and our talented cover designer has yet to complete the cover. For the time being, we are using the imprint within the book as the cover design. But, Michele Thomas, who has more design talent than one person should humanly possess will soon be sending Lets Go Publish, Publishers the final cover shortly. At that time, the webmaster on this site, will change this article. This fall was a period of inspiration for Mr. Kelly as it was just in the beginning of October that he had begun and had just about finished a book about the over-regulation of the United States business community. In this book, titled, Kill the EPA, Kelly outlines a number of the areas in which the EPA is stifling opportunities for US industries to prosper and to create jobs for us all. There is another lead article about this book on this site. You may not have to look further than a horizontal or vertical scroll to read about it. Unlike former presidential candidate Herman Cain's 999 plan, the RRR solution focuses on many more areas that need to be addressed for US to turn our economy around and stimulate job creation. Cain’s plan addresses only the tax structure, which must be changed as a start to solving our economic woes. The RRR plan, which also addresses taxes, reaches into many other critical areas that are impeding economic growth. You have seen the short list before-regulations, immigration, and spending. In addition to these and more, the RRR plan suggests that we alter our purely capitalist system into one that is more mercantilist. This book is designed to explain each problem and then solve it. No economist and no other candidate for office are offering as comprehensive a solution as RRR. Like the Cain 999 plan, RRR uses three catchy and unforgettable letters instead of three numbers. Unlike the Cain 999, RRR takes on the full set of issues that are addressed in the Kelly campaign. Along the way, U.S. Senate Candidate Brian Kelly outlines and fleshes out another three sets of 3 Rs. These and the initial RRR set will are necessary to help America climb out of its Obama funk. Why did Brian Kelly write this book? The quick answer is because it reflects his campaign platform. Our economy has simply stopped working and Barack Obama is the man carrying the stop sign. Our financial institutions have been forced to lessen their standards while the taxpayer has become the prop between the cronies of a corrupt government and their failure in business. The US adventure once starred rugged individualists and only the strong survived. America became the strongest nation on the planet. Government today uses progressive / Marxist principles to create a society of wusses and wimps, in which the American dream is little more than a handout. Businesses have decided that the US prize is not worth going after any more, and they have taken their work overseas. Government colluded with business enabling their quiet retreat. The RRR plan addresses all of the sticky areas where corruption reins and corporations, unions, and government have been able to undermine what is good for America and Americans. The RRR plan is good for the economy. It is good for the people. It is good for jobs. And, for those corporations that want to sign up to be American-centric, it is good for corporations. It is the solution balm that offers a gutsy, unique, real, and workable path to getting America back on its feet. There is nothing like it anywhere else. All we need is the resolve for the RRR plan to make us successful. Brian W. Kelly is one of America's most outspoken and eloquent conservative spokesmen. He is the author of Taxation Without Representation, Obama’s Seven Deadly Sins, Americans Need Not Apply, Kill the EPA and many other books. Like many Americans, Brian is fed up with the progressive / Marxist agenda in Washington that places the needs of everyone and everything, in front of the needs of Americans. 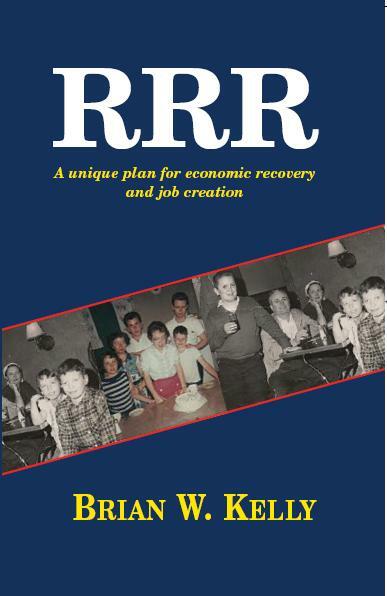 So, quite simply, it is time to adopt a plan built for recovery--the RRR plan. Kelly tells you exactly why and how in this book. Most of this book is available on this site for free for your reading pleasure. If you find a chapter in the Table of Contents that you would like to read online, feel free to send Brian and email at campaign@kellyforussenate, and we will either send you the chapter via email or post it online. Feel free to shop for this book and other LETS GO PUBLISH! Books at IT Jungle (www.ITJungle.com), and other fine booksellers I a bookseller that you trade with does not carry the book, tell them to contact Lets Go Publish and I am sure they would be pleased to ship to your bookseller.